The most difficult and challenging thing that I have ever done in my life was to immigrate to Haifa Israel at the tender age of fifty nine. I can think of no nation or place anywhere that has more spiritual significance than “The Land of Canaan” It is the birthplace of the three major faiths: Judaism, Christianity, and Islam. It is the place where King David wrote the 23rd psalm, where Jesus of Nazareth promoted ideas and values that have changed humanity. In the Quran, the inspired scripture that Muhammad brought to the Arabs, venerates the great prophets of the Judeo-Christian tradition. It speaks of Solomon’s “great place of prayer” in Jerusalem, which the first Muslims called City of the Temple. Haifa is the home of the Tomb of Elijah the Prophet considered one of the holiest and most venerated shrines to Jews, Christians, Muslims, and Druze alike. Haifa is a city dotted with gardens. The most prominent is at the world center of the Baha’i religion, with the tombs of the Bab (Mirza Muhammad Ali) and Abbas Efendi, son and successor of the founder of the abor.faith, Bahá’u’lláh. The presence of the Baha’i, for so long persecuted in various Middle East countries, is evidence of the tolerant social fabric of this city. The greatest challenge facing this small and brave nation is to promote the values of peace in an area filled with strife and hatred. “The Golden Rule” is a common link in the three major faiths that can and will draw us together to promote Shalom and Salaam. It is happening in Haifa the city of peaceful coexistence. I have been blessed to participate in many interfaith efforts in the past five years to promote peace through dialogue in Haifa, The City of Peaceful Coexistence. This holiday season I rejoiced to participate in several activities in Haifa to promote harmony. My favorite was an interfaith sports event hosted by the local Muslim Ahmadiyya school in the Kabbabir community in Haifa. On Wednesday, Dec 19th, 2012, between Hanukkah and Christmas, 50 teens: Israeli Jews and Muslim got together in Games for Peace organized by a new association called GESHARIM LETIKVAH: BRIDGES FOR PEACE- HEALING THE WORLD BY BRINGING HEARTS TOGETHER. Reform Movement Rabbi Dr Edgar Nof started the games by reciting a Prayer for Peace. Then the teen girls played a basketball game for peace, while the teen boys play soccer. The Jewish children came from the Open School in Haifa with their teacher Ya’ir Shachar. The game referee was Manar principal of the Ahmadiyya Muslim School in the Kabbabir neighbor of Haifa. Previous to every game the teens shook hands, and everybody wins by promoting Peace in Israel and by bringing hearts together. Imam Muhammad Sharif declared that their slogan is “Love for all, Hatred for none”. The Ahmadiyya are a world wide movement of more than one hundred million followers dedicated to peace and universal brotherhood. 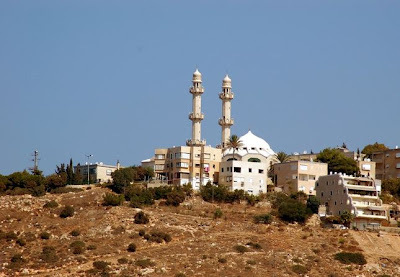 Haifa Mayor Yona Yahav has gone so far as to call them “Reform Arabs.” Most of the two thousand Ahmadis in Israel live in Kabbabir, they are leaders in the business, cultural and most importantly spiritual areas of our community. All the kids say at the end of the games that it was too short and that they want to meet again. We have planned more activities for the spring. Below a Rabbi and Imam build bridges for peace. Thanks for posting my story, and peace,brotherhood, and blessings.